This was a hunt that I've wanted to do for several years. Jeff & Kathy Laskowski owners of Tusk N Tines didn't disappoint me. It was a great hunt. I'd been kicking around the idea of going on a wild hog hunt for several years. This year, thanks to my kids and my son-in-law John Lame, the hog hunt became a reality. The hunt had been planned several months in advance. It seemed to take forever before it was time to go but finally Labor Day weekend arrived and John and I were on our way. After about a 10 hour drive from Des Moines, Iowa to Ryan, Oklahoma we reached Tusk N Tines Outfitters and were greeted by Jeff and Kathy Laskowski, who are two of the nicest people you will ever meet. We unpacked and had a quick lunch of delicious pulled pork sandwiches, made form wild boar, and we were off to our stands. I brought my LSA-65 Ithaca 30-06 rifle, which my wife had bought for me 42 years ago. 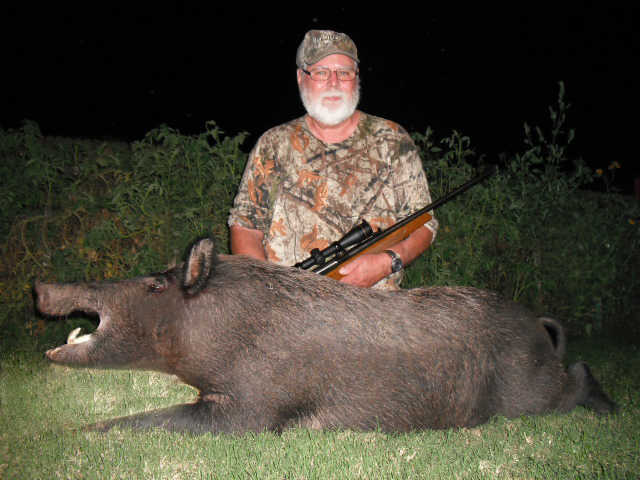 I had never hunted with this rifle and I had high hopes to shoot my first wild hog with it. When I reached my stand, I loaded it with hand loads I had made just for these hogs-168 grain Nosler ballistic tip bullets with 45.5 grain of IMR 4895 powder. I settled into my very comfortable stand and waited for the hogs. The hours went by and no hogs appeared, although I could hear them. I decided I didn't see them because the wind was swirling and assumed the hogs had probably caught my scent. 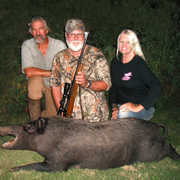 When Jeff and Kathy picked me up, I found out that three of the other hunters had shot hogs that evening. Not a big deal, as this is just the way hunting goes sometimes and I had two more evening to hunt. On the second evening I went to the same stand and was entertained by the squirrels, but again no hogs. I was then starting to wonder if I am doing something wrong. I showered before leaving, de-scented my clothes and sat very still in the stand. OK it must have been the swirling wind again. Good excuse as any. I'm sure by now Jeff is also wondering if I'm doing something wrong as everyone else has shot one or two hogs. On the third and final evening of my hunt, Jeff took me to a new stand that had not been hunted at all this year. I got into my stand and began the wait. I had a covey of ten bob white quail come in and were feeding in front of me. As I sit there enjoying them, I spotted my first wild hog. He worked his way down the bank and stopped with just his nose sticking out of the brush. As he was stiffing and looking around the covey of quail flushed, which scared the hog back into the brush. The last I see of him, he is going over the bank towards the river. It was still early, surly something else will come in. About a half hour later I see another boar coming down the bank. He stopped and turned broadside to me and I put the crosshairs just behind the ear on the neck and squeezed the trigger. He dropped in his tracks and I have my first wild boar, and my first kill, with the Ithaca rifle. I called Jeff and he and Kathy came out and dragged the hog out for me. They did all the work, all I had to do was hold the flashlight. When we got the hog back and weighed him, he was 210 pounds. This was the largest hog taken that weekend. This was truly a great hunt with great people. I would recommend Tusk N Tines to anyone. The hunt was great, the accommodations were great, and the food was great. I'm already thinking of booking another hunt next spring.